A scene from the Native American Weekend at the Village Church Farm, Skegness, with Hayley Harbach (left) and Wendy Harbach. 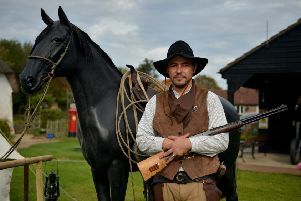 A little bit of North America came to Skegness when the resort’s Village Church Farm held its latest themed weekend. Following on from the Steam Punk event Carry On Steaming at the start of July, the museum hosted a celebration of Native American culture last weekend. Alan Blackhorse doing the Eagle Dance. Visitors to the Church Road South attraction were treated to performances of Native American songs and dances, including a rain dance, which, sadly for some, did not break the dry spell the UK has been experiencing lately. Kellie North, assistant manager, said the event was ‘thoroughly enjoyed’. The museum’s next event is medieval themed with the Knights of Skirbeck on the August Bank Holiday Weekend.